PASSAIC, N.J. (WABC) -- Officials in Passaic, New Jersey are confirming that no alarm system was activated during an 8-alarm fire that tore through an apartment building Wednesday. City officials last inspected the building's alarm system in July and say it was working back then. The cause of the fire, and the faulty alarm, are still not known. Hundreds of residents were displaced by the fire. A massive fire destroyed a Passaic, New Jersey apartment building on Wednesday night. The fire is said to have started on the top floors of the building. The blaze quickly burned through the roof of the large Gregory Avenue apartment building in Passaic shortly after 8:45 p.m. The flames started on the upper floors of the building in a wing overlooking the Broadway side and spread across a connecting area to a second wing. Portions of the roof collapsed. The building houses 60 apartments. Two firefighters suffered injuries. They were taken to St. Joseph's Regional Medical Center in Paterson. A portion of a ceiling fell on one, while another suffered burns to the neck. The building was evacuated. None of the hundreds of residents evacuated were injured. 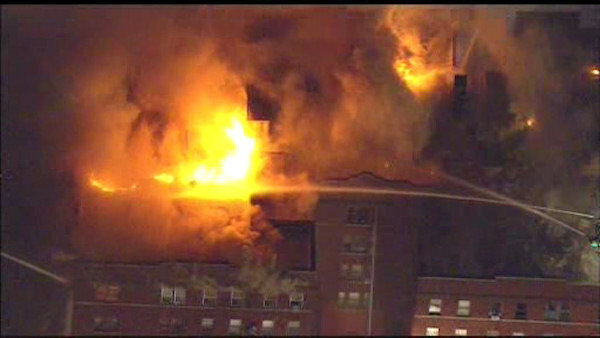 Passaic officials estimated between 300 and 400 people lived in the building.